To become a fossil, it takes a lot of luck. Your carcass needs to be buried rapidly and then lie undisturbed for tens of thousands, hundreds of millions, or even billions of years. It’s a process that seems best suited to tough, hardy organisms – ancient sea shells, armored trilobites and giant dinosaur bones are what typically comes to mind when we think of fossils. Delicate and beautifully detailed fossils of the gently curved leaves and stems of exotic plants, the veined wings of strange insects, and the mussed feathers of dinosaurs defy our expectations. Fossils that capture such fragile details are a startlingly clear window to an alien world. At the same time they make that world seem very familiar. In Lindley Williams Hubbell’s poem about fossils, it’s this defiance of expectations that induces a sense of awe and a feeling of the continuity of life across “some odd billion years.” Hubbell is particularly inspired by the fern-like fossil algae from the Ordovician Period, which followed the Cambrian, beginning about 490 million years ago and lasting for about 45 million years. The Ordovician was a great period of invertebrates and algae, all living in the oceans. Vertebrates, particularly jawless, armored fish, were also beginning to show up in greater numbers. And by the end of the Ordovician, there was a major development: the earliest fossils of land-dwelling organisms appear. It was a time of major change and and also major extinction. Hubbell’s poem beautifully captures how the delicate fossil algae bring together opposite impressions, a sense of fragility and permanence, distance and immediacy (“a billion years at my elbow”), and thereby inspire a tremendous sense of awe and pleasure. That I can read with pleasure. And cannot see them, though I'm told they're there. Move me almost to tears. My sense of wholeness, a billion years at my elbow. From American Poetry: The Twentieth Century, Vol. 2 (New York: The Library of America, 2000), originally published in Seventy Poems (Denver: Swallow Press, 1965). Reprinted in accordance with the Code of Best Practices in Fair Use for Poetry. 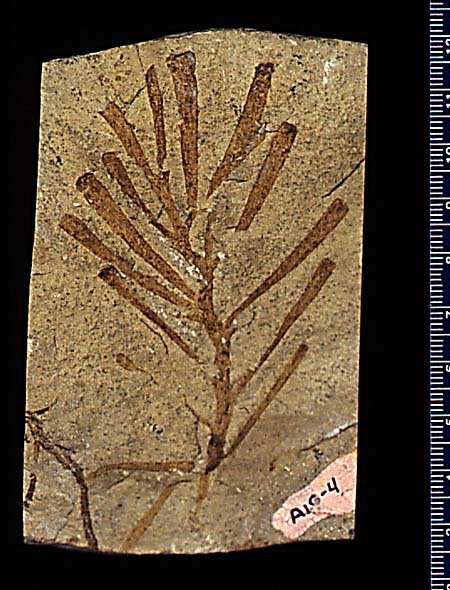 Image of Lake Winnipeg fossil algae, via the University of California Museum of Paleontology. This entry was posted in Follies of the Human Condition and tagged fossils, science poetry, Sunday Poem. Bookmark the permalink.